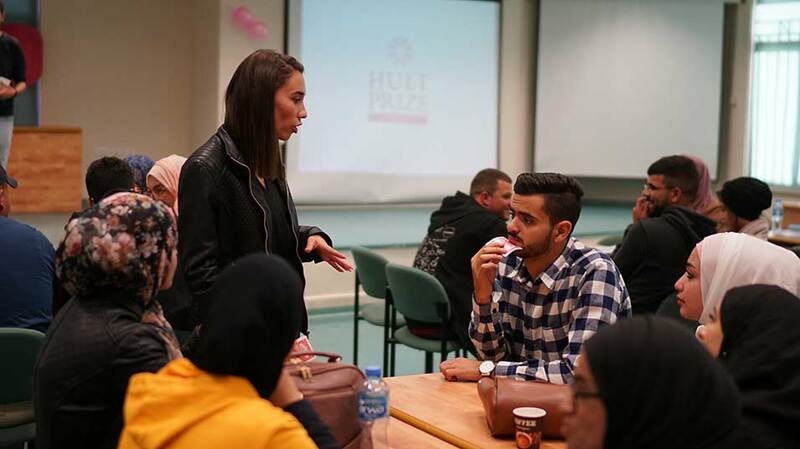 The Hult Prize, an annual year-long competition in which aspiring social entrepreneurs compete to change the world for the better and secure $1 million dollars in funding for their social enterprise, has begun its 2018 competition, which aims to solve youth unemployment. 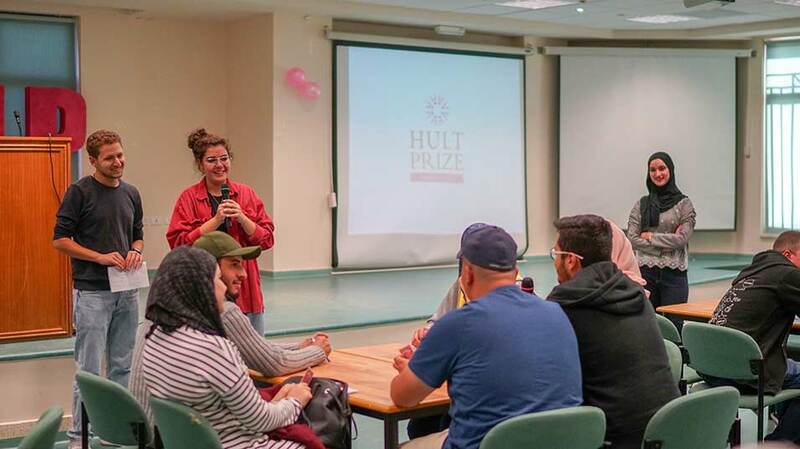 To prepare the young entrepreneurs for the competition, the Innovation and Entrepreneurship Unit at Birzeit University organized an information session, , featuring Hult Prize ambassadors, coordinators, and past competitors, on Wednesday, October 31, 2018. 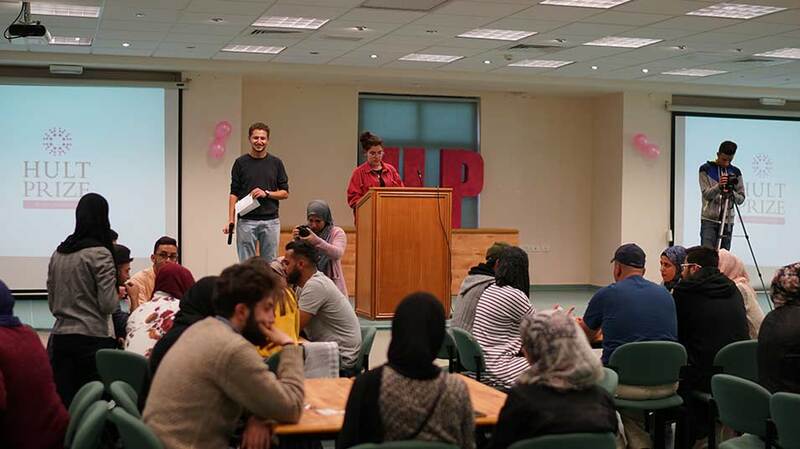 The presenters, two Birzeit University students, explained the aims of the competition to the attending students, and why this year’s challenge focused on unemployment. Palestine, they said, stands to gain most out of the ideas and solutions submitted to the contest, as it has one of the highest rates of unemployment in the world. The presenters explained that the Hult Prize requires contestants to base their ideas on four main pillars: Learning, which means that the idea should promote gaining knowledge and experience, as opposed to all-around general education; Matching, where the social entrepreneurship ideas help to match buyers and sellers; Sourcing, through which the work is outsourced and in-sourced, identifying talent and overcoming distance; and Creating - that is, creating meaningful work by inspiring, educating, and supporting entrepreneurs. The info session included ice-breakers - activities that help bring contestants together - and featured Ameen Taha, a previous Hult Prize contestant, who shared his experiences in coming-up with an idea, assembling a team, and reaching the Accelerators phase. The top 50 startups competing for the Hult Prize qualify for the Startup Accelerator, in which the teams gain access to coaching, state-of-the-art facilities, and mentorship by top experts. Birzeit University will hold a competition to select the top teams with ideas that will impact youth unemployment. The teams will then head to regional contests and compete with international teams. After the finals, the 50 top teams are invited to a six-week Startup Accelerator. Of the 50 teams, six will move on to the finals and a chance of winning $1 million in seed funding.